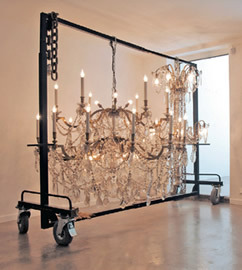 Although Ian Kiaer graduated (from London's Royal College) in 1999, his quietly cerebral practice has proved something of a slow-burner, overshadowed, perhaps, by the glitzy production values of much late twentieth-century art. Trained as a painter, Kiaer changed direction after viewing a show of architectural models that prompted him to embark on his own scaled-down environments. Although his works occasionally incorporate conventional miniatures - and also retain elements of painting - Kiaer prefers to evoke through mundane, found materials which ostensibly bear little resemblance to the poetic, reference-laden landscapes he seeks to convey. Kiaer's sources of inspiration are both scholarly and eclectic, encompassing figures and movements as diverse as Alexandre Dumas, Breughel, the 16th-century Korean artist Yang Paengson, theatre, art, architecture and philosophy. Connections and resonances are teased from his subject matter to form unexpected elisions; Kiaer is just as concerned with unorthodox approaches to construing knowledge as alternative ways to present it. Brueghel project/Casa Malaparte, for example (left), deftly links the 16th-century Flemish painter Brueghel with the 20th-century Italian writer, journalist and politician Curzio Malaparte, who, in 1933, was exiled by Mussolini to the Italian island of Lipari. After being freed, (and although re-arrested several times throughout Mussolini's regime) Malaparte decided to build himself a home on an isolated clifftop on the island of Capri. Its sleek, box-like design and extraordinary rooftop patio - reached by an unusual flight of steps inspired by Lipari's church - features prominently in Jean-Luc Godard's 1963 film, Le Mépris (Contempt). 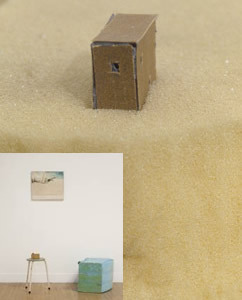 In Kiaer's work, the remoteness of both Malaparte's island exile and eventual home in Capri is indicated by a tall stool on which a chunk of brown foam is topped with a tiny model of a house. 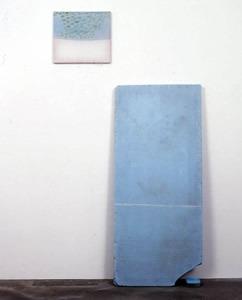 Beside the stool, a larger block of blue foam seems to represent a surrounding sea. On the wall behind this arrangement, a canvas depicts a windmill precariously perched on the summit of a slender mountain. Its motif is extracted from Brueghel's painting The Procession of Calvary, a work that is dominated by its unusual rock formation. In fact, Breughel's depiction is almost certainly drawn from time spent in Italy, a journey which introduced the Low Countries painter to the grandeur of mountains. Sketches completed on Breughel's travels, as well as subsequent works, attest to the huge impression these landscapes made. The rocky spindle in the The Procession of Calvary bears strong similarities to the rugged terrain in both Capri and Lipari; it has been ascertained that Breughel travelled south, through Naples and probably as far as Sicily, from which Lipari lies just a short distance north. In Malaparte's 1949 novel 'La Pelle' (The Skin), he claims that Erwin Rommel visited the house in 1942 and asked the writer if he had bought it ready-made or designed it himself. Pointing towards the sea, Malaparte replied that the house had been there, but that he had designed the landscape. It's highly unlikely, in fact, that Rommel really visited the Casa Malaparte, but the anecdote is intriguing given that Breughel, too, designed much of the landscape in The Procession of Calvary based on what he had seen on his Italian travels. There are yet more connections to be teased from Kiaer's work. It's possible, for example, to view Malaparte's own political persecution and personal calvary echoed in Breughel's Biblical scene. And Jean-Luc Godard's Le Mépris consists of a film within a film, a metafictional narrative of the type beloved by the nouvelle vague. Kiaer's installation, too, consists of intricately interwoven layers conjured up by nothing more than a few humdrum items. Meditations on identity lie at the heart of Vo's increasingly acclaimed practice - an identity which, for Vo himself, is deliberately shifting and fragile. His personal history supports this sense of indistinct self. Born in Vietnam in 1975, Vo's father, like many others, secretly built a boat in order to escape the new communist regime. In 1979 the family set off with the intention of reaching America, but were discovered drifting at sea by a Danish freighter, brought to Denmark and given Danish citizenship. Raised within two very different cultures, Vo approaches his art as if still metaphorically adrift, obscuring his own presence while exploring themes of conflict, memory (or lack of it, as Vo has no real recollection of his early life in Vietnam), personal and political history. On completing his art studies in Copenhagen, for example, Vo rejected active participation in his graduation show; instead, his family were assigned the task of contributing all the pieces on display and even collecting his diploma. For Vo, this 'impersonation' not only obscured his own presence, it afforded those close to him an opportunity to enhance their own sense of identity and status. It was, he has explained, the first time many of his family members had participated in an official event, and more crucially, represented for them a small reconciliation with the country in which they had lived as refugees for decades. Family members still remain involved in Vo's practice, producing, for example, art multiples according to his directions. In another example of Vo's wish to subsume his own presence, in 2006 a former tutor, Tobias Rehberger, was persuaded to exhibit a reproduction of the boat in which the family fled Vietnam. Crucially, Vo rejected the notion of co-authorship - the project was deliberately attributed to Rehberger alone. The slippery nature of Vo's relationship with his own art and, indeed, public persona, is exemplified by a former Berlin show, 'Good Life' in which the apparent subject of the show is the photographic work of Joseph M. Carrier (left). Carrier was employed as a US counterinsurgency specialist during the Vietnam war, but eventually dismissed due to concerns that he might be homosexual. 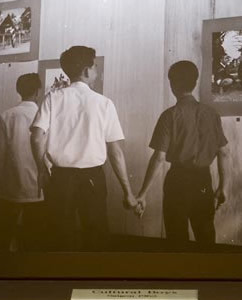 His photographs, taken in the mid-60s, certainly support this view, mostly depicting young, attractive, Vietnamese men. An extract from his diary states: "while my people work I play with the ex. Viet Cong [É] a hand slips down and feels my larger thigh [É] more play, with camera and posing." In Carrier's images and writings, the conflict of war is echoed by the collision of official duty with private desires. For the viewer, the act of piecing together Carrier's biography is also the act of unwittingly approaching Vo's life - his homosexuality; his cultural roots; the historical background that led to his refugee status. If Vo's practice encompasses familiar investigation into authenticity, authorship and appropriation, his principal aim is far more unusual - to mediate the construction of self via a startling demonstration of its fragility.